Mohini Dey, daughter of bass player Sujoy Dey, has been described as prodigy by many acclaimed musicians and has already been making waves in the music scene in India. Born in 1996, Mohini is probably the youngest bass player in India having such a busy schedule and an already successful career. She started learning bass guitar at the tender age of 3 and started doing concerts and recordings at the age of 10. She's happiest when she is with her SDGR bass. 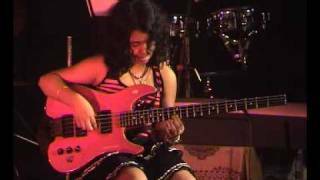 Mohini says: "when I was a small child, I was drawn towards my father's bass guitar. He noticed my interest and started teaching me. 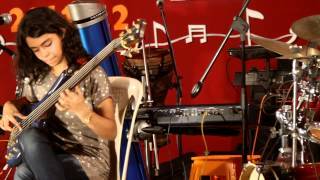 Thanks to him and my entire family, I'm able to do what i really like… I want to be a versatile musician, just like my dad… I love playing funk, jazz, blues, Indian classical and fusion…"
Mohini has played with musicians like Ranjit Barot, Zakir Hussain, U Rajesh, Selva Ganesh, Nitin Sawhney for Coke Studio, Harmeet Manseta, George brooks, Babu Choudhary, Niladri, Clinton Cerejo, Shridhar, Suchitra Pillai, Louiz Banks, Gino Banks, Karl Peters, Floyd Fernandes, Darshan Doshi and many more.